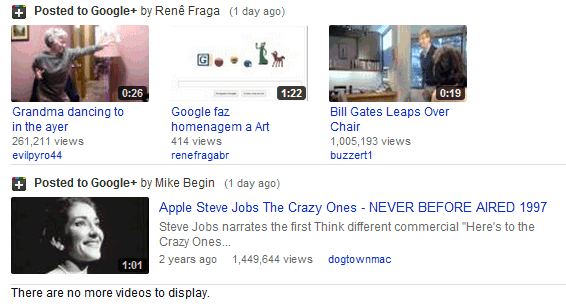 YouTube now lets you connect your Google+ account and watch the videos shared by your friends on YouTube's homepage. At the moment, AutoShare is not available and you can't automatically share activities like uploading a video, commenting on a video or liking a video. To enable this feature, go to Settings > Sharing and click "Connect" next to Google+. You'll have to wait a few hours until YouTube starts to show videos shared by the people you follow in Google+. Unfortunately, there's a significant delay and the videos aren't added in real time. I was literally looking for this feature just yesterday but looked over this connection feature because it wasn't really that intuitive or self explanatory in my opinion. Thx for posting this tip! They still have major problem as Jason Nocks pointed out with Usability. Hopefully this will change when we get deeper integration. How many sign on screens does Google need and does it really make sense to have a separate sign on screen for each service. I forgot, did Google already buy Youtube service? I have allowed for the sharing and my videos are automatically uploaded to G+ and visible on my Web Picasa account but they still do not show up on YouTube after 3 days.... anyone else noticing the same thing???? can google plus connect to facebook.... ?? i heard that FB does not allow this, it can hurt competition isn't it... ? Don't see it in settings page... I use english interface but with russian IP is that the case? 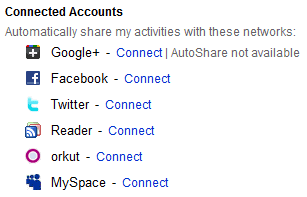 I have all options except Google+ which I am looking for. Well I've tried but couldn't get it. My Google Account refused to connect my YouTube account. causing the old Google Account is "violate" term of service of YouTube 3 years ago. Accounting to YouTube's nowadays' term of service, it is not a really violation. So I have to keep my YouTube account unlinked. Someone to help with it? One element to be aware is that this won't function if you designed your YouTube login name was always attached from the starting to a The search engines Consideration (e.g. every new YouTube login name since May 2009). In that situation, there's nothing to "unlink" from. This only relates to individuals who designed their YouTube & The search engines Records independently, then attached them together at some factor later on. When The look for engines Plus released, its red announcements showed up over the top of most The look for engines websites, but that was all the incorporation as customers got. Associations between Plus and other The look for engines solutions have came gradually. Probably the most convincing hyperlink so far is with Documents and Hangouts, enabling customers to work together on a papers deal with to deal with. You can also reveal The look for engines Charts on Plus. But few mature The look for engines solutions take benefits of the new river of Plus articles. The look for engines has included community Plus articles into look for, but that was about it before this new YouTube hyperlink. Even for apparent ones like The look for engines Audience, if you want to hyperlink with your Plus consideration, you have to do it yourself.